If your home has a wooden deck or patio, build a deck bench to make the space more accommodating and comfortable for you, your family and your friends. A home-made deck bench will be durable and long-lasting, and you'll feel confident every time you sit on it because you'll know that you made it yourself. Plus, you'll save quite a bit of money by building it yourself. The size of your bench is going to be determined by a number of factors, primarily how many people you want it to fit and whether or not you want it to be easily movable. Making the bench movable will provide your deck and yard with greater flexibility because you can set the bench anywhere. It will also give you the freedom to store it over the winter or remove it if you need the extra deck space. Ideally, your measurements should include approximately 30 inches per seated person; if you want the bench to fit four people comfortably, make the bench 120 inches long. The base of the deck bench needs to be sturdy and strong, so use 4x4 boards. Depending on how long you're planning on making your deck bench, make one base for every three feet of bench. To make one base, take a 4x4 plank and cut two pieces 14 inches in length and two pieces 9 inches in length. Put the pieces together on a flat surface so they form a rectangle. The two 14-inch pieces should be the sides with the two 9-inch pieces forming the top and bottom. The two 9-inch pieces should be on the inside of the 14-inch pieces. Mark the 14-inch pieces where they meet the two 9-inch pieces so you know where to drill your pilot holes for the lag screws. Keep your marks as close to the center of the board as possible. Drill the pilot holes in the 14 inch pieces and countersink the holes so the lag screws will be flush with the wood when installed. A small router bit will work fine for making the countersink. Put the pieces of wood back together into the rectangular formation and secure them together using lag screws and washers. Use a socket wrench to make sure the lag screws are firmly set. Make the remainder of your bases in the same way. Cut nine lengths of 2x2 planking to whatever length you need for your bench. Set up the bases so they are three feet apart and lay one length of planking on top so it is flush with one side. Secure the plank to each base using deck screws. Set another length of planking flush with the other side of the base and secure it to each base with deck screws as well. Position the remaining seven lengths of planking between the two original lengths and start securing them in place, leaving about a ninth of an inch of space between each plank. Make sure that each screw head sinks into the wood at least an eighth of an inch to prevent snags or injury. Once the deck bench is assembled, use sandpaper or a router to sand the wood to a soft, smooth finish. 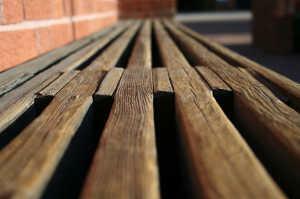 Clean away the debris and apply a few coats of your choice of sealant, paint or stain to protect the bench. Learn how to build a deck bench and take the time to do it; you'll make your backyard more inviting, more comfortable and more fun. This job takes just a few hours to complete, but you'll enjoy your new bench for many, many years.